Honeybee larvae develop into workers but not queens, in part, because their diet of beebread/pollen is enriched in plant miRNAs. While miRNAs are generally negative regulators of gene expression in eukaryotes, they also negatively regulate larval development when honeybee larvae consume beebread/pollen and take up plant miRNAs. Xi Chen and Chen-Yu Zhang's group in Nanjing University, report this finding on August 31, 2017 in PLOS Genetics. In previous studies, Chen-Yu Zhang's group has reported a striking finding that plant miRNAs are ingested from plant diets and pass through the gastrointestinal tract, enter into the blood, accumulate in tissues and regulate endogenous gene expression in animals. Their findings suggest that ingested exogenous miRNAs can regulate endogenous gene expression and reshape animal phenotypes. Interestingly, since the components of beebread/pollen are mainly plant materials and royal jelly is a glandular secretion of nurse bees, the diets for worker- and queen-destined larvae are differentially derived from plant- and animal-sources. 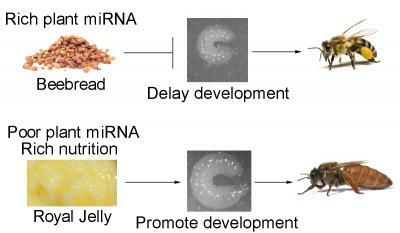 Therefore, Xi Chen, Chen-Yu Zhang and colleagues decide to investigate if miRNAs from different larval diets may have distinct impacts on honeybee development. 1) This study reveals a previously uncharacterized role for RNA in beebread/pollen instead of protein, sugar and hormone in royal jelly to influence caste differentiation. The theories about honeybee caste formation need to be re-examined from a new angle besides the traditional focus on royal jelly and its components. Overall, the positive effect of royal jelly and negative effect of plant miRNAs on honeybee development may maintain the stability of the colony's social order in a coordinated manner. From this standpoint, plant miRNAs are not accidentally included as a part of the food but instead collected with specific purpose, probably for the survival of the honeybee colonies. The researchers of this project include Kegan Zhu, Minghui Liu, Zheng Fu, Zhen Zhou, Yan Kong, Hongwei Liang, Zheguang Lin, Jun Luo, Huoqing Zheng, Ping Wan, Junfeng Zhang, Ke Zen, Jiong Chen, Fuliang Hu, Chen-Yu Zhang, Jie Ren, Xi Chen of State Key Laboratory of Pharmaceutical Biotechnology, NJU Advanced Institute for Life Sciences, Jiangsu Engineering Research Center for MicroRNA Biology and Biotechnology, Nanjing University, Nanjing 210093, China; College of Animal Science, Zhejiang University, Hangzhou 310058, China; Model Animal Research Center and MOE Key Laboratory of Model Animals for Disease Study, Nanjing University, Nanjing 210061, China; Cold Spring Harbor Laboratory, Cold Spring Harbor, NY 11724, USA. Xi Chen and Chen-Yu Zhang at Nanjing University conceived and designed the experiments; Jie Ren at Cold Spring Harbor Laboratory contributed significantly to analysis and manuscript preparation; Rearing of honeybees was performed in Fuliang Hu's lab at Zhejiang University; Rearing of fruit flies was performed in Jiong Chen's lab at Nanjing University.